Sorry this letter was delayed. Work and Thanksgiving got in the way. 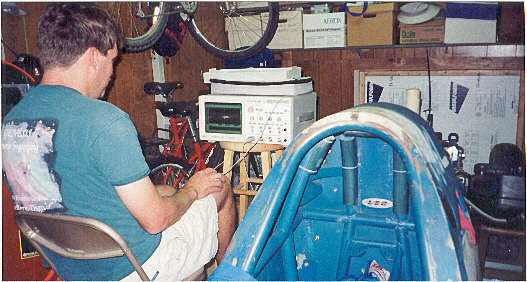 Alan using a $$$$$$$$ Oscilloscope to "tune" the data logger computer. 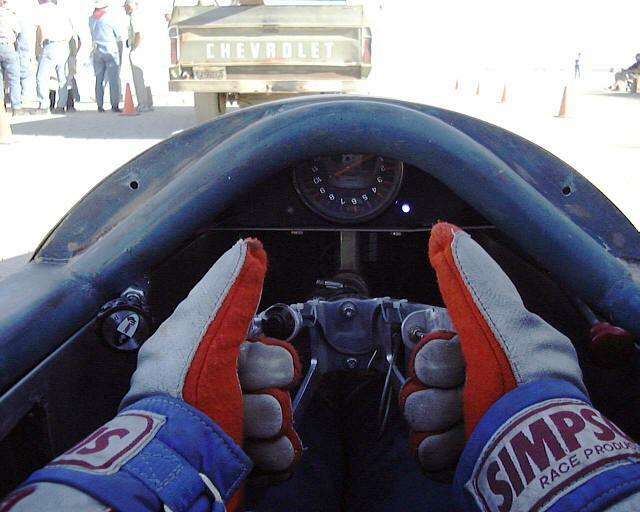 The final race of the 2001 season was held at El Mirage Lakebed on November 17th & 18th. For the past few years the November meets have been a two day meet to attract competitors from farther away. 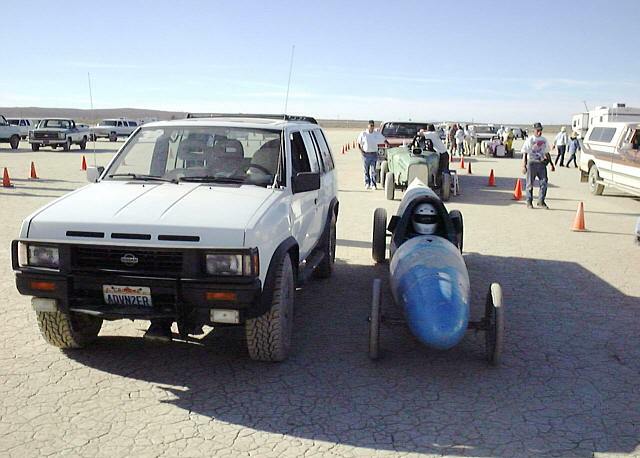 Mark Vigeant took a half day off on Friday to pack and drive the race car up to the lakebed by Friday evening. Alan and I, (James), left Orange County about 6:00 PM. and were in heavy traffic most of the way there. What we were hoping for at this race was to see what our intake air pressure was doing during a run. We had previously hacked into the Hayabusa's air sensors and connected them to our data computer to see what was going on. Unfortunately, due to some cabling problems there was now way to test the system prior to the actual meet. Once Mark arrived at the lakebed, he dropped off the racing trailer, and pulled our camping trailer our of storage, which we keep in a storage lot near the lakebed during the racing season. (Storage costs for the year was one case of Miller beer.) On Saturday morning, Alan and I set up the timing equipment, while mark got the race car prepped for inspection. Then I stayed in the timing tower while Alan and mark raced the car. Our first run was in the low 160s, but the data computer didn't function correctly, and we didn't get the data we wanted. Alan and Mark decided to forge ahead, and attached some pre-made, large metal scoops to the air intakes, for the second run. With the added air, our second run was at 169.8 mph, less than 3 miles per hour short of the class record, and the computer showed the new scoops were making intake pressure. The weather was nice all day, but the meet was stopped at 3:00 PM to allow time to move and clean the course that would be used on Sunday. Saturday night / Sunday morning was the famed Leonids Meteor Shower. The peak time for Southern California was supposed to be at 2:00 AM, and since we race in the desert, far from city lights, I expected to see a good show. I wasn't disappointed. I got up about 1:45, and immediately saw several good meteors. I told Alan to come on out, and a few minutes later went back and woke Mark up to see it. He had intended to sleep through it, but I made him get up anyway, and I think he enjoyed the show. We saw as many as 5 meteors at a time, and at least once a minute there was a bright meteor that would have been the highlight of any other night. We went back to sleep around 2:20. Sunday morning, Alan and I again set up the timing equipment, and racing started around 8:00. Because our car had been one of the last to run Saturday, Alan and Mark had a leisurely morning until our third run about 10:30. We got two runs on Sunday, but neither was able to improve upon the 169.8 from Saturday. So the close of the 2001 season left us with a 169.8mph on dirt, and 184.9mph on salt. We got 945 points for the season, which made us 34th overall, out of 184 registered vehicles. Now in the off season, we have 6 months to work on the car before the next race in May, 2002. Our first priority will be to finish the body work, and get the car painted. Several people had asked, begged, and finally demanded that the car be painted so it can be photographed. It did pretty good for it's first season, but wasn't photogenic enough to make the press. By May, we should have it looking good, and all those photographers will have to make good on their promises.This will probably be the second to the last newsletter for a while. There will be one more special one next week, and then we're taking a break. For the time being, we are taking some time off, and slowly disassembling parts of the car. Some frame pieces need repainting and then the body work will come next. the temporary scoops will come off, and some nicer, larger ones will go on. Then Bondo and sanding. Finally, Marks's neighbor has volunteered to do our paint job. The first time he saw the car he ran off to get a photo album of cars he's painted, mostly show cars with elaborate flame jobs. He'd never painted a "real" race car, and was thrilled when we agreed to let he do it. From time to time, as we get pictures of the progress, we'll send out a news letter.